The French Government Tourist Office, in cooperation with the Provence-Alps-Côte d’Azur Tourism Board, has just issued a 48-page booklet with beautiful color photographs that highlights the Jewish aspects of famous cities like Avignon, Marseilles, Arles, Aix-en-Provence and smaller towns in the Provence region of south central France. Titled Provence Jewish Heritage Routes, it is based on Jules Farber’s French book, Les Juifs du Pape en Provence. An English version, The Pope’s Jews in Provence, is available as an e-book. The booklet gives a brief history of Jewish residence in the area, dating back to the first century B.C.E., and then focuses on the various cities and their salient Jewish features, like the famous synagogue in Carpentras (built in 1367), France’s oldest; and less well-known towns like Tarrascon and Trets, each with its own little spot in the Jewish history of the nation. For years,Hollywoodhas tried to revive DC Comic’s scantily clad female superhero, which was played on television by Lynda Carter from 1975 to 1979. The character of Wonder Woman, created during World War II to fight Nazis, the Axis powers and other villains, has continuously failed to make it to the big screen. But perhaps Gal Gadot will make the magic Golden Lasso of Truth spin again. The Israeli actress—most recently known for her turn as Giselle in the last three Fast & Furious movies—was tapped to play the Amazon Princess in Warner Bros. 2015 Justice League film: Batman vs. Superman. While largely unfamiliar to most American audiences, Gadot, 28, is well known to Israelis since she was crowned MissIsraelin 2004, then gracing magazine covers and television ad campaigns as well as starring in shows such as the 2010 to 2011 crime drama Asfur. 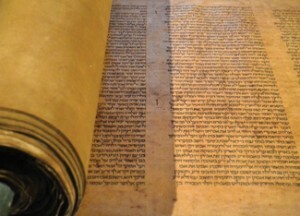 The 800-year-old Torah scroll. Photo courtesy of the Library of the University of Bologna. 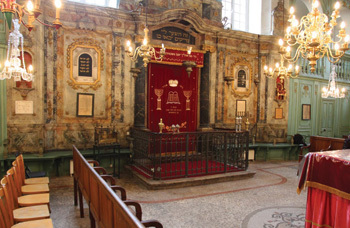 Bologna, Italy, may seem like an unlikely place for the world’s oldest complete Torah scroll. The University of Bologna has housed an 800-year-old manuscript for centuries, but it was only recently that professor of Hebrew Mauro Perani uncovered its true age. While recataloguing the university’s archive of 30 Hebrew manuscripts, he noticed that the sheepskin scroll seemed to be wrongly dated to the 17th century by a previous librarian and cataloguer. Perani, who has devoted his career to the study of Hebrew manuscripts, knew that there had been two scribal traditions—one from Babylonia and one from Palestine. He realized the scroll, with its elegant Oriental script, unusual layout, graphic style and crowns on different letters, predated the rules for copying Torah scrolls fixed by Maimonides at the end of the 12th century that canonized the Palestinian tradition. “The Bologna scroll is a very rare example of writing a Sefer Torah exactly according to the Babylonian tradition,” says Perani, adding that other Babylonian-style scrolls were likely collected in genizas (storages). Two carbon-14 tests confirmed the scroll was written between 1155 and 1225. 17 percent of children of Israeli Americans in the country 10-plus years are intermarried (compared to 58 percent for American Jews). About 50 percent of Israeli Americans attend synagogue; of those, 44 percent attend Orthodox services. Among Israeli Americans in the country less than 10 years, there is a greater likelihood of attending Conservative and Reform congregations. Around 20 percent of Israeli Americans are between 16 and 34; 44 percent between 35 and 44; 15 percent between 45-64; and 11 percent above age 65. A spicebox, part of the new Charles and Lynn Schusterman collection of Judaica at the Museum of Fine Arts, Boston. Photograph copyright Museum of Fine Arts, Boston. 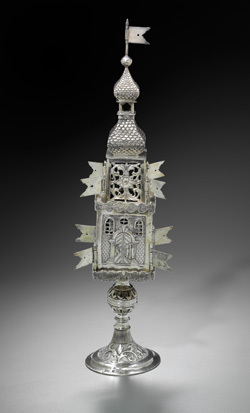 A silver Hanukka lamp from 18th-century Berlin and a papercut with fantastic animals and zodiac signs made in Eastern Europe in the late 1800s are two highlights of the recently acquired Charles and Lynn Schusterman collection of Judaica at the Museum of Fine Arts in Boston. Ornamental domestic objects have traditionally enriched celebration of Jewish rituals and holidays, and the new collection features pieces designed specifically for the home. The 119 pieces range from metal spiceboxes, textiles and ceramics to sculptures and paintings. Before Lynn Schusterman, who founded the Schusterman Family Foundation with her late husband, Charles, gifted her treasures, the museum owned 12 pieces of Judaica. An official Israeli committee has collected the names of 1,400 Ethiopian Jews who died en route to Israel and will inscribe them on a monument erected in their memory in 2007 on Jerusalem’s Mount Herzl, the national cemetery. Approximately 17,000 Ethiopian Jews made aliya in the 1980s clandestinely, fleeing their country’s civil war to Sudan and living in refugee camps before being secretly airlifted to Israel. The memory of those lost on the way has festered as an open wound for the immigrant community, now numbering 120,000, as they had not been able to give the dead proper burials and mourning rites.